This particular picture was taken in January of this year. 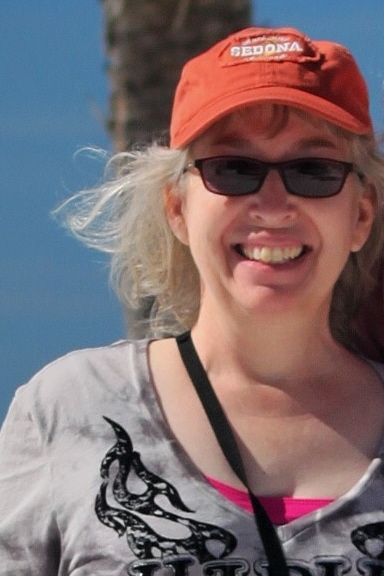 Bless my sister-in-law, somehow she took a photo of a woman that appears to have aged well. Wrinkles are mostly unseen and you can’t tell what color that hair really is. In truth, I remember the original Lost in Space. Not reruns. I was quite young, but even then I knew it was something different. Somewhere around the age of 10, I checked out a book from the local library that introduced me to the female heroine in Sci Fi. It may also have been the first Sci Fi book I read. Enchantress From the Stars by Sylvia Engdahl is a YA Sci Fi classic. I still have a copy on my shelf. In high school, I got a cashier’s job at the local movie theater. 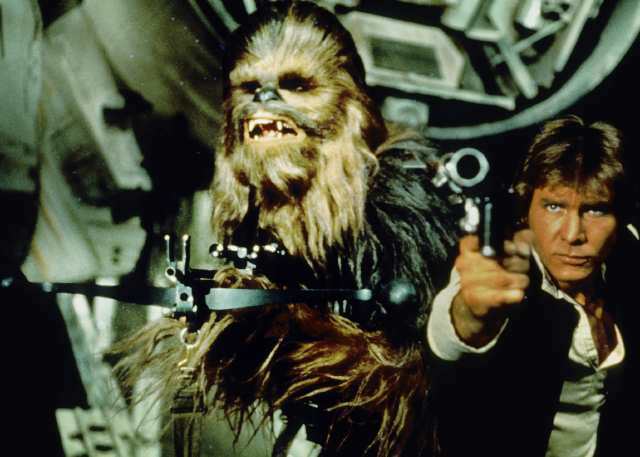 Even before the movie was released, everyone knew Star Wars was going to be a huge hit. Lots of hype. I sold tickets and then went into the theater to watch. 4 times I missed the beginning of the movie because I was working. Finally, on the 5th time, I watched the entire thing. Two words. Han Solo. Sci Fi is my favorite genre. In TV, books, and movies. But my favorite way to enjoy Sci Fi is reading. So here I am, contributing to this brilliant blog. I can say brilliant because I’ve only been here a couple months. A lot of other people made it brainy and bold, I’m just along for the ride. Joining the Smart Girls team is one of the highlights of 2015 for me. I love books. All kinds of books. Historical, mystery, fantasy, paranormal, suspense, and of course Sci Fi. Romance can be found in various proportions in most everything I read. There are a few exceptions, but not many. My reviews of historical and paranormal romances are sometimes found on the blog Ramblings From This Chic. Since woman cannot live by books alone, even though I try really hard, I have a job working in IT. Though it is not Sci Fi, at least it is techy-ish. A day job allows me to buy tea, dark chocolate, whiskey, high-speed internet and books. My husband likes it when I buy other groceries too, so I do, cause you know, love and romance and all that good stuff! Now, from time to time, you will find me here at Smart Girls Love Sci Fi Romance trying to get you to read something I think is wonderful. Chances are you won’t like everything I like, but hey, if we all liked the same thing it would be a dull, dull world. One more thing. I am a cat lover, but I will try not to obsess about cats. Unless there is a cat character in a Sci Fi story. 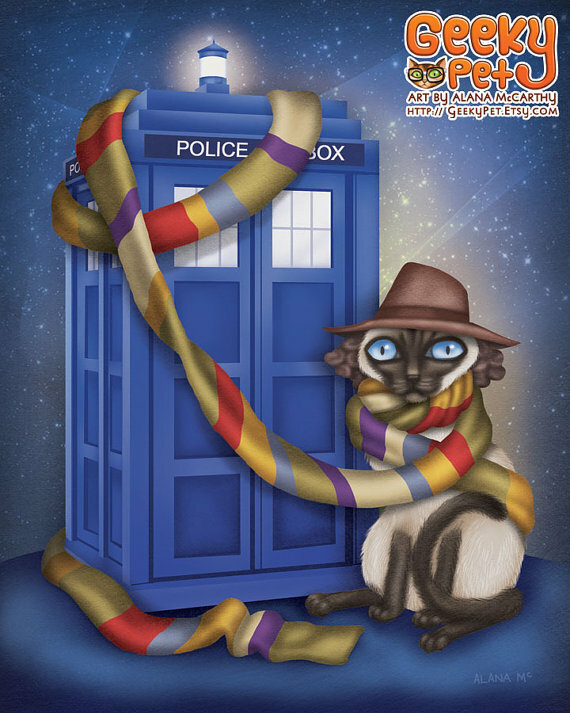 If you like the Dr. Who Cat, please check out artist Alana McCarthy on Etsy or Facebook. Hahahaha! I love your grocery list!!! Thanks! It varies some times. I occasionally substitute tequila for whiskey and peanut butter for dark chocolate! ‘Cool’ is not a word I often hear describing me. Thanks awesome Pauline! I knew dark chocolate was good for you long before it came out in the news. Okay, maybe my knowledge was not very scientific, more intuitive. But I take credit. Thanks Diane! Kindred spirits unite! Sci-fi and dark chocolate…yes ma’am! I recently saw a post that can justify our consumption. Chocolate is cocoa. Cocoa is a plant. Therefore, chocolate is…salad. But, since it is also a bean…you have vegetables! Either way works for me. I too remember the original Lost in Space. I may even have had a slight crush on Billy Mumy. My love of sci-fi books started as a teenager with authors Pohl and Heinlein and H.G. Wells. Good stuff. Isn’t whiskey made from grains? Therefore you have added one more food group. Look forward to reading your reviews on this excellent web site! Hi Celestine! I believe we’ve also connected on Goodreads. I like to read your reviews there. I too like your grocery list! Though I think I would trade the whiskey for my husband’s homemade kaluha. Which can lead to romance…. so I just need to put on some scifi movie in the background to have a complete evening. Hello Riley! From this little bio here, I think we will get along just fine! You didn’t mention anything here I didn’t like, if not LOVE! Han Solo! So, I will be watching for your reading recommends. Thank you for sharing some of yourself! Thanks for stopping by. And appreciating Han Solo. Oh Han! What is it about a bad boy space pirate? I loved Games of Command. It is my favorite Linnea Sinclair book! I didn’t read it because of the cat. But Tank was quite the bonus! I also have a soft spot for dogs in my fiction.